Students all around the world are going to school and hopefully giving their best to gets those grades. 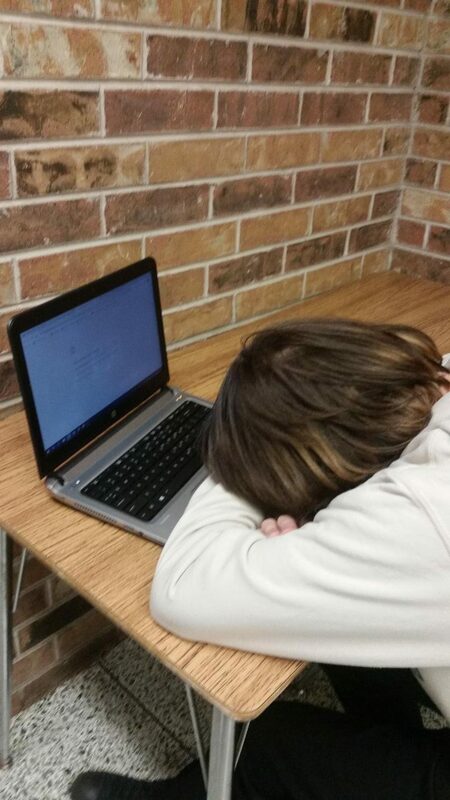 But sometimes students have a hard time doing their work and paying attention in school due to drowsiness from lack of sleep or bad sleeping habits. The average teenager gets seven to seven and a half hours of sleep every night, but teenagers should be getting nine to nine and a half hours. They need sleep just like everyone but sometimes due to school, work, or family. They don’t get the hours they need. One of the major causes is the early school start time. Most high schools start as early as 7:00 a.m. to 7:45 a.m. This usually makes student start to wake up between 5:00 and 6:00 to get ready and travel to school. Then students spend all day in school listening to lectures and doing work and some have work and afterschool activities that keep them busy till ten at night. So not only does it affect school grades but behavior. Students need to get a good amount of sleep to perform well in school. There are many ways that could help students get a good night’s sleep. Some ways to keep a great sleeping habit would be as easy as turning electronics off before bed and not oversleeping on weekends. Maintaining a regular sleep schedule would help, too, but with homework and work it can be hard. Students should avoid caffeine, smoking, alcohol, and drugs. All of these things are something people should avoid before bed because they will keep you up longer instead of getting as much sleep as one can. With these simple solutions, students can get more sleep and perform better academically and have a better mood throughout the day. There are many other things that could be done to help but these are some of the major ones. this is so true. even I can say I don’t get enough sleep and I need more and I know that a lot of people do too. Sleep is such an important thing for students to function and keep good grades. I love how there are facts and how lack of sleep can affect a student. I think that average sleep teens get is actually lower. I know that me and some of my friends get closer to and average of 6 hours of sleep. Nonetheless, I like there can be more done to help teens get a proper amount of sleep. Teenagers are too often sleep deprived. Last year, I had headaches every day from lack of sleep and this year to avoid that, I started doing some of my homework in the mornings instead of at night. Somedays I have club activities and would often come home at around 4:30 and 5 pm then I would spend hours preparing and making dinner. By the time that all my household chores are done, it’s around 8 to 9 and by then I’m pretty much too exhausted, but still has a mountain of homework to go through. I’d work on the easy ones like math and chemistry then leave harder ones to do in the mornings. I usually wake up at 3 in the morning to make breakfast and do some of my homework then. Good job on your article! This is such a big problem in today’s society. Teens and young adults should be getting a lot more sleep than they are and the main reason behind this is because of school and work. Hopefully, the school system will adapt to the needs of the students in the future. My average sleep time is definitely less than seven hours. To what extent does getting fewer sleep hours starts affecting behavior? Sleep is so essential for brain development. But school start times are getting in the way. I think they should push back the start time. I don’t think everyone needs the same amount of sleep, I think it depends on the person and how much sleep they actually need. I do feel like this is a rising problem though amongst the high schoolers. I can personally relate to this as I don’t think I get enough sleep each night.